Being a minimally successful artist (commercially), I always admire artists who succeed in their art when the cards are stacked against them. Yes, I’m talking about women artists again. In the West, women have always participated in society as professional artists, but, up until the late nineteenth century, it was not easy for them. This was due primarily to the fact that, in a male-dominated culture, being an artist was considered “unsuitable” for women. This was especially true about architecture. If it was hard for women to enroll in art academies in the nineteenth century, it was even more difficult to study engineering in order to become an architect. Julia Morgan, however, became the first woman to enroll in the École des Beaux-Arts in Paris in order to study to become an architect. 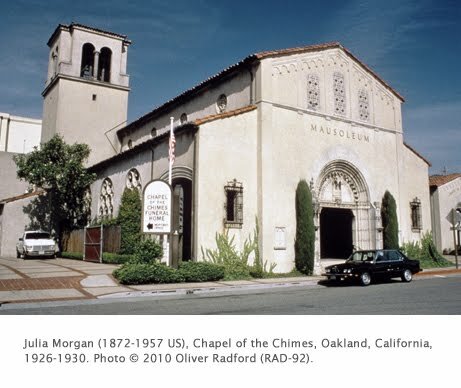 Julia Morgan was born in San Francisco and grew up in Oakland. In 1890 Morgan enrolled at the University of California at Berkeley, an overwhelmingly male school. She eventually decided on a career in architecture and received a degree in civil engineering in 1894. While studying at Berkeley she attracted the attention of the famous architect Bernard Maybeck (1862-1957), who hired her to work in his studio. Maybeck suggested that Morgan study at the École des Beaux-Arts in Paris, the most prestigious architecture school in the world at the time. At the École des Beaux-Arts, Morgan’s primary training was in historicist (revival) styles. After graduating in 1902, she opened an office in San Francisco. During a period when many architects experimented with modernism, Morgan’s designs tended to be conservative and respectful of her clients’ tastes. She had a large network of women friends from her college days at Berkeley, which helped her obtain many commissions for a variety of buildings. Morgan designed in a number of revival styles during her career. The majority were built in the then-fashionable Spanish Colonial Revival style. Striking features of the Chapel of the Chimes are the stonework grilles on the arched windows and beautifully carved surround of the entrance. Red-tiled roof, whitewashed walls, arcaded cornices, ironwork, and low-relief carvings completed the style. During her career, Morgan designed nearly 700 buildings, including work on the Hearst Mansion and the rebuilding of the Fairmount Hotel in San Francisco after the great earthquake and fire of 1906.